We have no idea why The CW has chosen to title its most promising new shows Life UneXpected. But instead of questioning the network's sanity, we'll just be grateful that the pilot for this program was picked up in the first place. 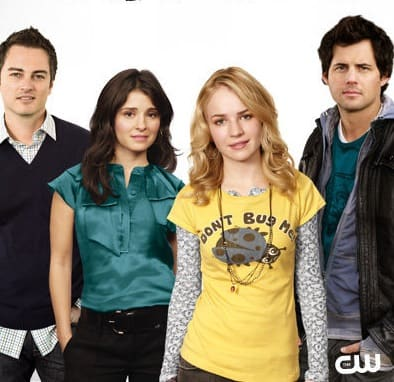 While it won't air until early 2010, Life UneXpected - which hasn't received nearly the same hype as other CW offerings, such as The Vampire Diaries - has already received rave reviews from critics that received a screening of its first episode. It stars Britt Robertson, Kristoffer Polaha, Shiri Appleby and Kerr Smith. Two days prior to her 16th birthday, Lux only wants one thing: to be emancipated. A perennial foster child, she must track down her birth parents and have them sign away their rights to her in order to have this goal accomplished. Lux sets out and meets Nate "Baze" Bazile, a total slacker. This is Lux's father?!? She can't believe it. Her mother, meanwhile, turns out to be a popular radio show host in Portland, Cate Cassidy. While bother father and mother are willing to sign her documents, the judge won't allow it. Instead, he orders Lux into the temporary joint custody of Baze and Cate. How will they handle this unexpected twist in their lives? That's where the series really begins.